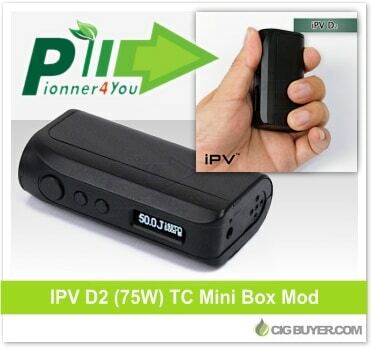 The IPV D2 75W Box Mod is the latest offering from Pioneer4You, packing 75W of power and temperature control into a super compact package. Powered by a single 18650 battery, the IPV D2 Mod includes a quick access removable battery cover and can fire standard kanthal coils down to 0.2 ohm, or TC nickel coils down to 0.05 ohm with a temperature range of 200 to 580F. It includes the latest Yihi SX130H chip and is packed with advanced features; including power adjustment in volts and watts, as well as joules.